Turn the tables this Halloween when you battle Darth Maul again! Live on as this epic Jedi Master in a licensed Qui Gon Jinn costume. 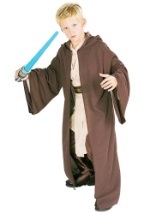 The Star Wars costume has a tan shirt with tunic that runs long in length. Brown pants with an elastic waist and boot top are also included. The brown mock belt can be tied in the back to accommodate many sizes. Add a Qui Gon Jinn lightsaber or Jedi robe to have a deluxe Star Wars costume!